Although, in the midst of home restorations and visiting family, ironically I can always find time for coffee and teatime. Of course, there are plenty of other tasks and crafting sessions that I usually miraculously make time for as well. But, this particular day was all about making an unsightly corner that had hardware buckets and all of the unfashionable, but very useful home tools into an appealing space. We have this corner in our home that will be no more ... or to nicely put it, be an interior visionary space revamp. There are simple ways to create a cosy little nook, especially when it's just to help motivate your productivity, or in our case relax over a lovely cup of espresso. I know, oxymoronic as it may sound, believe me, espresso did the job! Here's a few helpful and inspiring tips. I took what was left from a box of trimmings: a mason jar, dried flowers, safari figurines, and planters that I used for another home project. I started with these wonderful wild animal miniatures and placed a large piece of wood on the tray as a great source of natural inspiration. 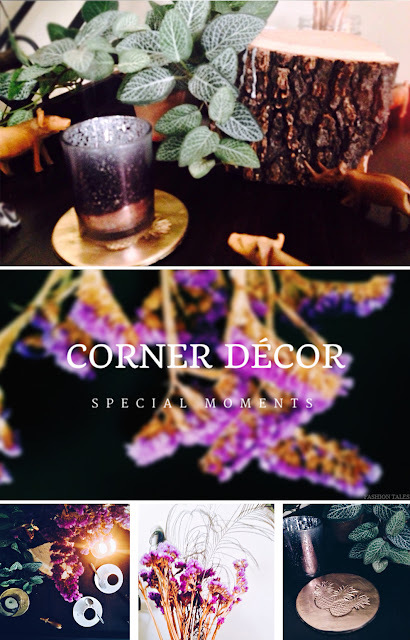 I am no novice when it comes to rustic décor, and I do love the occasional grandiosity of decorating, however this time I focussed on one to two elements: our love for animals, and the sheer purpose of this corner. Everything coordinates harmoniously with each other. I used nature as influence — green from the plants, black, and white from the zebras alongside the white espresso cups, and browns, deep oak, and purple accented colours from the wood and dried flowers. The idea was to not make it look too polished, so I loved using the tree bark with the vine semi-wrapped around it, then accented stamped and brushed gold coasters that I made from polymer clay. A somewhat asymmetrically balanced corner, if that makes any sense. If this was a larger corner space to fill, I could easily use artwork on the wall, or even a small secretary table in the area. In the opposite corner we have had a DIY ladder that I painted in the past, and used it as an accent bookshelf. Since this was a smaller corner, I used an ottoman with tan and beige jacquard fabric to set the tray on. This also makes a more intimate space. So, instead of relaxing in structured chairs, use gigantic bean bags or floor cushions. Time out for a shot of espresso, amidst home renovations have never felt more comfy. What do you think or our espresso corner? Perfect decor like the espresso corner. Have a great weekend. I've always wanted to do something like this for my room but never actually find the yime coz I'm too busy. I agree with Carrie. It's definitely chic. Beautiful composition! 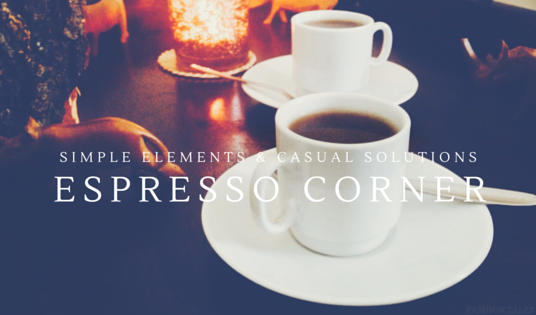 Would love to have an espresso in your corner.